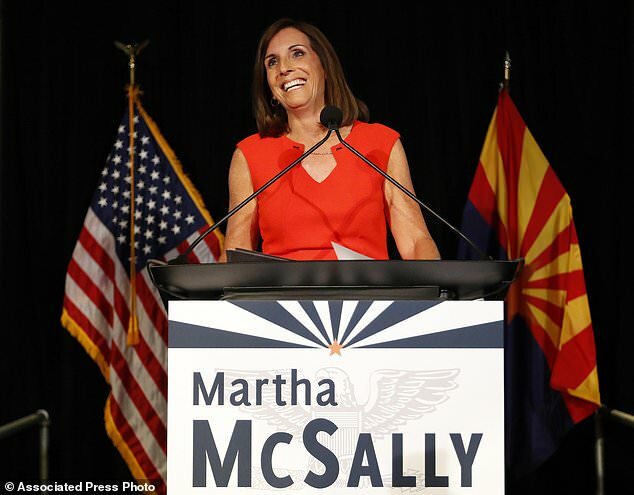 Rep. Martha McSally won the Republican nomination for Arizona's U.S. Senate seat on Tuesday, setting up a November contest with Democratic Rep. Kyrsten Sinema, and immediately found herself at the center of a brush fire lit by President Trump. 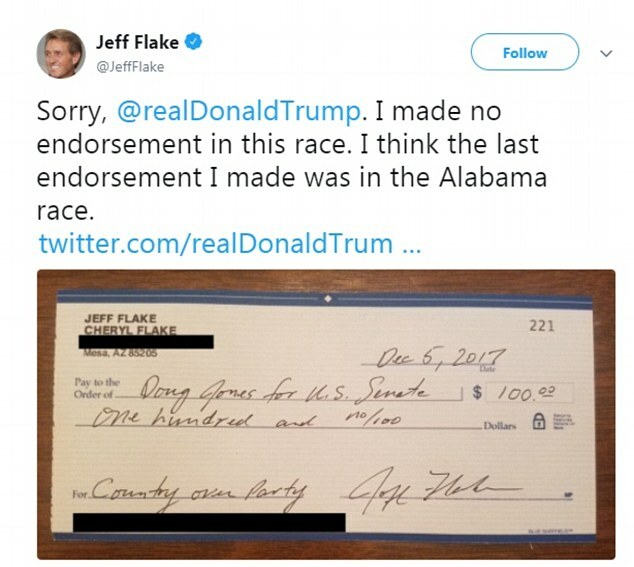 Trump claimed in a tweet congratulating the establishment-backed Republican candidate that she 'turned down' an endorsement from outgoing Sen. Jeff Flake - a political enemy of the president's and the current seat-holder. The president refrained from making an endorsement in the three-way primary, and Flake says he did, too. 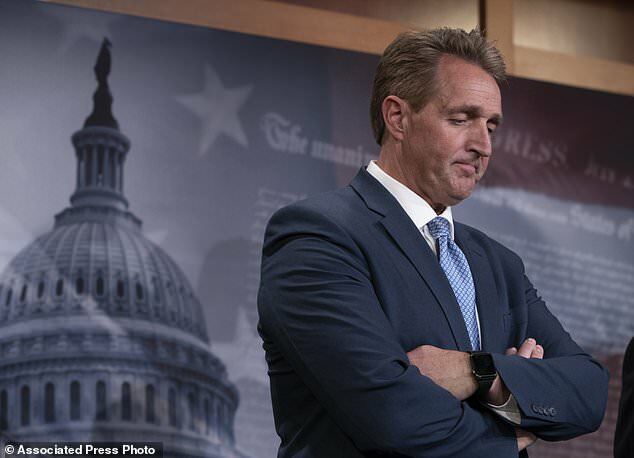 Trump successfully pushed Flake out of the U.S. Senate after he belittled the GOP senator as 'weak' on the border and backed one of his primary opponents, Kelli Ward, after coming under withering criticism from the sitting senator who shares his party affiliation. Flake denied Trump his endorsement in 2016 and vocally opposed aspects of his agenda and message while on a book tour last year. He was especially critical of Trump's 'both sides' comment after the Charlottesville race riot and has questioned the effectiveness of a coast-to-coast border wall. After two months of tangling with Trump, he dropped his bid for reelection and torched the Republican president in a floor speech that reflected on the current state of conservatism. A three-way battle ensued to replace Flake, with defeated state senator Ward facing off in the Republican primary against McSally, a former Air Force colonel who represents a Tucson-area swing district and was the first woman to fly a jet in combat, and former Maricopa County Sheriff Joe Arpaio, who the president last year pardoned. The primary happened in the shadow of the death of Arizona's senior senator, John McCain, whose body will lie at the Arizona Capitol on Wednesday. Both nominees have pledged not to campaign then or Thursday in his honor. In a statement, Sinema mentioned McCain, who was known for bucking his party. "It's up to all of us to follow his lead of always putting country over party," the Democrat said. McSally began her victory speech with a moment of silence for McCain. "It's difficult to celebrate anything this week," she said. 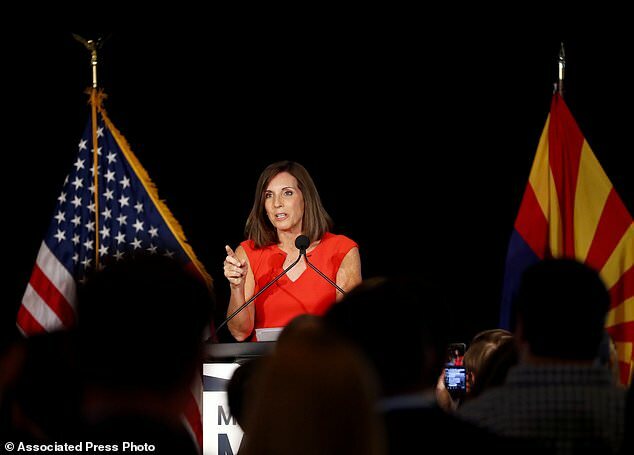 But much of McSally's speech was a lacerating attack on Sinema. "This is how I see this campaign," McSally said. "It's a choice between a doer and a talker. Between a patriot and a protester." Arpaio, a former six-term sheriff of Maricopa County who'd never lost a GOP primary, was in third place. In a low-key event at a Greek restaurant near his home, he said he'd dedicate himself to ensuring President Donald Trump gets re-elected in 2020. Also in Tuesday's primary, Republicans nominated Gov. Doug Ducey for a second term and Democrats selected education professor David Garcia to challenge him. In the state's 9th Congressional District, Steve Ferrara, the former Navy chief medical officer, won the GOP nomination to face Greg Stanton, Phoenix's Democratic former mayor. Arizona has an open Senate seat this cycle after Flake decided to leave office. The seat is considered a key pickup for Democrats in their bid to take control of the chamber, meaning the general election will be among the closest-watched Senate races in the nation between now and November. Television ads have already bombarded Arizona residents throughout the summer months, and a competitive general election is likely to draw in millions of dollars in outside spending for television ads and other campaigning. 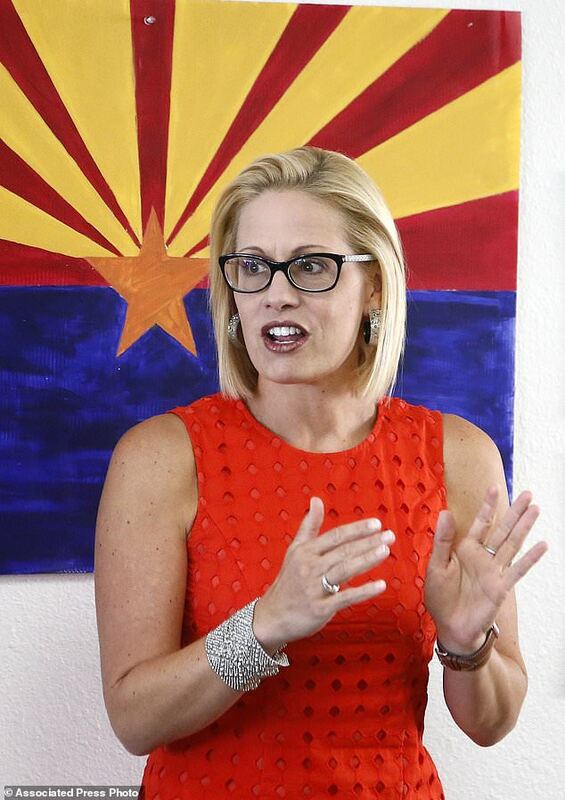 Sinema was long favored to win the primary and is seen as a competitive Democratic candidate in a general election that could hinge on how voters feel about Trump and his policies. While her centrist approach and Blue Dog Democrat status may not appeal to the state's voters who are far to the left, her willingness to be bipartisan could curry favor among the state's large crop of independent voters. If she's victorious, Democrats could pick up an Arizona Senate seat for the first time since Dennis DiConcini left office in 1995. In a state whose electoral votes went to Trump, the Republican nominee could use voters' support for the president to their advantage. 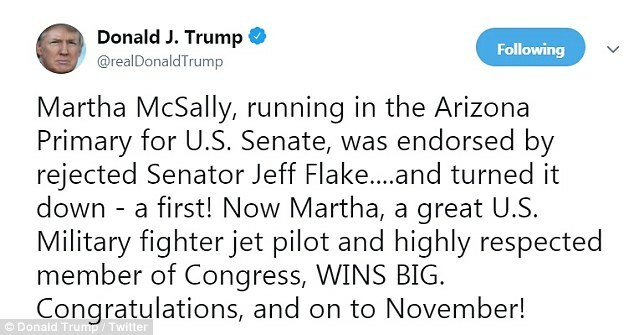 McSally, Ward and Arpaio all campaigned on their various connections to Trump during the primary. In mid-August, McSally's campaign boasted about the president calling her "terrific" while introducing her at an event. Meanwhile, Ward was endorsed by former Trump adviser Steve Bannon, and Arpaio noted his early support for Trump's presidential run. The Republican candidates also distanced themselves from the ailing McCain, who died after most ballots had already been cast by early voters. McSally drew criticism from McCain's family when she did not mention his name in the signing of the recent defense bill, which was named after McCain. 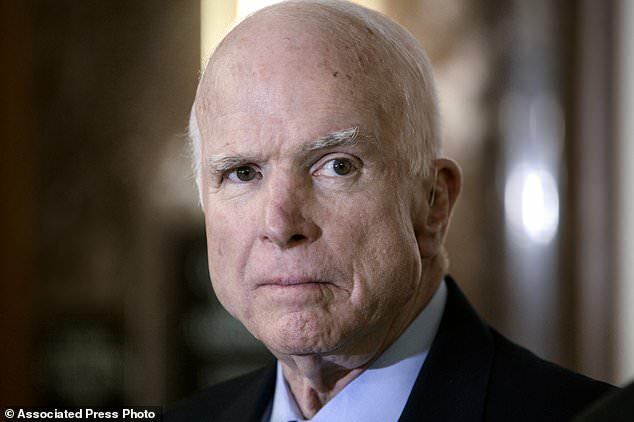 Hours before McCain died on Saturday, Ward suggested in a since-deleted Facebook post that his family had announced he was ending medical treatment to hurt her campaign. 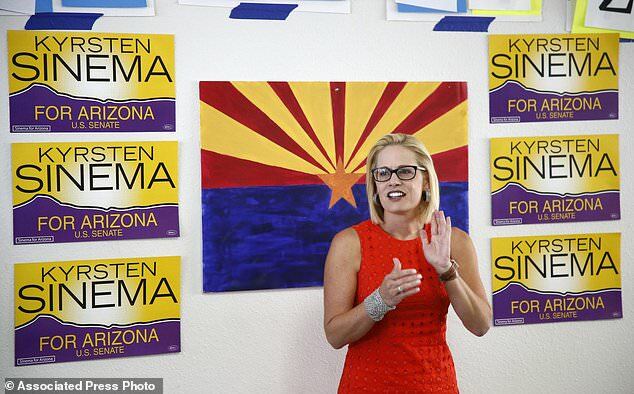 After McCain's death, Sinema and Ward suspended their campaigns for Wednesday and Thursday.